Altas Cables adds two new interconnects to Hyper range | What Hi-Fi? 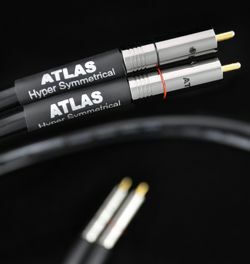 Atlas Cables has announced two new stereo interconnects as part of the company's Hyper range. Hand-made at the company's factory in Kilmarnock, the Hyper MK II Asymmetrical and Hyper Symmetrical cables are unbalanced and balanced respectively. Both cables use copper cabling with 99.9997% purity and claim to provide 100% rejection of radio frequency interference. Atlas Cables own patented gold-plated copper RCA plugs provide the terminations on both cables, and are finished in a high-gloss silver. With custom lengths available to order, the Hyper MK II Asymmetrical is available in RCA or BNC form for £160 for a 1 metre pair, while the Hyper Symmetrical cable is available as a 1m RCA cable for £250 or a 1m XLR pair for £375.